She was born Bonnie Jo Schleuning March 27, 1951 to Eugene & Betty Schleuning in Dodge City, Kansas. She attended Dodge City schools and graduated from DCHS in 1969. Bonnie was an avid fossil digger and prospector for 25 years in the Green River Formation. Having found the oldest bat known in 2003 and providing the specimen to scientific community the specific name Onychonycteris Finneyi was given in honour of Bonnie Finney who collected the holotype. Bonnie was published in Nature magazine on Valentines day 2008 on pg 818, and numerous news papers and publications around the world. She has birds and bats in the American Museum of Natural History in New York and the Onychonyeteris Finneyi in The Royal Ontario Museum in Canada. On Dec. 26, 1970 Bonnie married Glenn Elwell in Dodge City. They resided in Arkansas City, Kansas. To their union two children were born. Shannon M. Elwell & Zach M. Elwell. They later divorced. Bonnie married Robert (Bob) Finney on April 13, 1986 and was married for 27 years. She enjoyed being a mother to her 4 great children, wife and grandmother to her 9 grandchildren. She enjoyed great adventure and nature. She was a very peaceful person and enjoyed life. 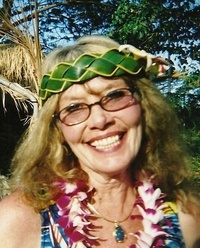 Bonnie Schleuning Finney, 62 left this world on August 20, 2013 at her home in Kemmerer, Wyoming with her family by her side. She was a Daughter, Sister, Wife, Mother, Grandma & Friend to many. She will be greatly missed by all that knew her.